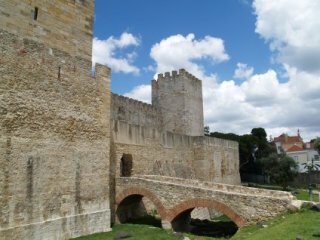 This medieval fortress was, after the Christian Reconquest, the royal residence until the royals moved to the Commerce Square. From the Castle of São Jorge we enjoy a spectacular view over the city and the Tagus' mouth; we can see the port area and the ferry-boats and ships crossing the river continuosly. Walking around in the castle we can see the diferent places that were part of the building. Around the main entrance there are a lot of souvenirs shops. You'd better going up to the castle by tram and as long as we finish we can go down walking toward the viewpoints, and finally we can wander around Alfama's streets. If you feel like going up walking to the castle, it is useful to start at Rua da Madalena, near the Rossio Square, and turn left at the Escadinhas de Sao Cristovo; if you are coming through the Rua de Santa Justa, from the elevator, as soon as you reach Rua Magdalena turn right and some metres further on you will find the Escadiñas. The entrance to the castle cost 5€. Inside it you can find a restaurant and a bar.